There are millions of registered users on LinkedIn. Relatively few of them seem to have any real understanding of how to use LinkedIn to achieve their goals. Do you? '42 Rules for 24-Hour Success on LinkedIn' uses a unique combination of simple strategies, tactics and clever ideas to create clarity in the murky, yet powerful new world of social networking. Rule # 3 – Get LinkedIn or Get Left Out? Rule #7 – What Does a LinkedIn Lead Look Like? Chris Muccio is an award-winning entrepreneur who draws upon insightful experiences from his successful career in Corporate America to guide business leaders on the most effective strategies to uncover profit and growth opportunities resulting in rapid and sustainable improvements within their business. His insight on Social Networking is highly sought after. Peggy Murrah is the owner of a highly successful web design and virtual assistance business, providing her clients with resources to succeed in the online world of business. Through her ongoing networking, she created strong business relationships with entrepreneurs across diverse industries, and facilitated many mutually beneficial connections among them. There are millions of registered users on LinkedIn. Relatively few of them seem to have any real understanding of how to effectively use LinkedIn or how powerful a tool it really is. Do you know how to use LinkedIn to achieve your business goals? In 2008, people wanted to know how to use LinkedIn and we wrote the first edition of this book, which became an Amazon Best Seller. Today, there is a clear demand to learn more about what LinkedIn can do and what is needed to effectively use LinkedIn to generate results. Although the usage of LinkedIn is exploding, there are very few resources that teach what users are craving – solutions to increase their desired business results. In this almost completely new second edition of our book, we share our powerful 4 part methodology and then provide you with planning, tactics, techniques (and success stories) to help guide you toward generating business success through LinkedIn. 'Rules for 24-Hour Success on LinkedIn' is a user-friendly, fast-paced resource designed to help you leverage the power of LinkedIn to build your business strategy, generate positive awareness to your brand, engage your leads and create trust. Who do we tend to do business with? Those we trust. There is a theory that everyone in the world is connected by no more than 6 people. You know who you are, but who else in this socially-connected world knows you and more importantly, what are you doing for them to generate trust in you. Use efficient strategies to build a high-quality network of connections. In addition to providing over 100 tips, insights and tactics, the second edition also provides a dozen success stories for you to read and understand the paths others have used to generate success. LinkedIn is far from just a job search engine. Don't waste time "guessing" on how to generate your LinkedIn success. '42 Rules for 24-Hour Success on LinkedIn' uses a unique combination of simple strategies, tactics and clever ideas to create clarity in the murky, yet powerful new world of digital lead generation. Get unlimited access to this book and all of LeadGen20/20's digital assets. Chris also continually conducts research and pulls together the best articles, presentations and videos on lead generation on the Web. There is no need for you to do all yourself when Chris has done the work for you. Have 24/7 on-line access to all LeadGen20/20's digital assets to stay current on methodologies you can use today. Purchase the LeadGen20/20 bundle and have an access to all of this content for $19.95 per month or $99.95 per year with the first month free. 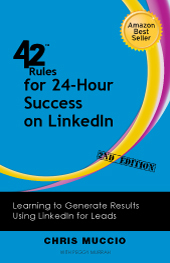 Want a branded edition of 42 Rules for 24-Hour Success on LinkedIn (2nd Edition)? For those of you unfamiliar with LinkedIn or looking to understand how helpful it can be for your career, this E-Book is a great resource. "Reading this book will give you a solid foundation for your LinkedIn strategy!" "Peggy, Chris and David have created an easy-to-read and implement guide to LinkedIn that really does the job of getting you connected fast. In the social networking jungle, this is one of the best guides you'll find - for a site that reaches YOUR people!" "'42 Rules to 24 Hour Success on LinkedIn' provides straightforward, common sense advice on how to get the most out of LinkedIn – the most popular social networking site for busy professionals. In this compact book, Chris, David and Peggy show you what to do to leverage the power of social networking on LinkedIn. And they do it in an easy to use, enjoyable read. If you want to build a network of likeminded professionals, you need to be on LinkedIn. 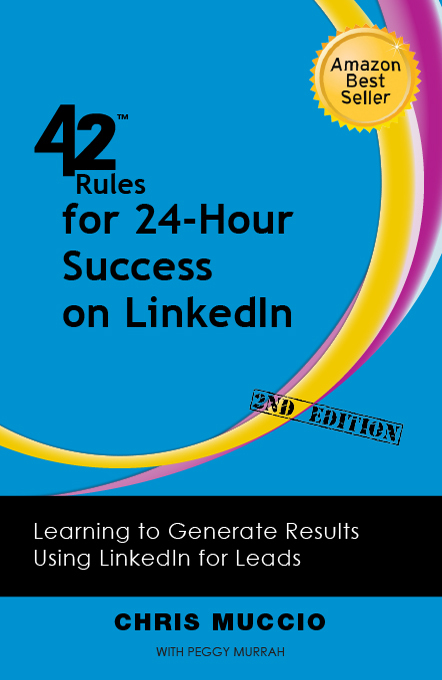 If you're on LinkedIn you need to read 42 Rules to 24 Hour Success on LinkedIn. "These 42 Rules provide entrepreneurs, corporations and job seekers with gems of advice and are the perfect resource to make sense of how you can generate success with LinkedIn. For new users, it is provides a terrific overview and for experienced users, it is a great reminder of the things you may know intuitively but may have forgotten in the rush of our hectic schedules." "The book is a very practical, yet easy and fun read. It is impressive in its clarity presenting the various aspects for generating 24-hour success on LinkedIn without the typical hype. You will come away understanding the core business principles driving your LinkedIn success." "From a business perspective, Social Networking is changing every day with new technology, tools and strategies. With so many options at our fingertips, users are challenged simply trying to determine where to begin and how to effectively use these tools. Given this bewildering landscape, the book '42 Rules for 24-Hour Success on LinkedIn' ties it all together quite simply and provides excellent practical tips and advice as how to effectively embrace this change. "As an Executive providing counseling to hundreds of displaced employees annually, I am always looking for new ways to provide job seekers with leading edge tools to help make their searches more effective. This book nails it! It is a user-friendly roadmap for understanding the power of LinkedIn and helps move readers successfully along the path of their choosing. I highly recommend this to both clients and businesses! "Amazing! In this timely and cutting-edge book, the authors share their secrets to increasing your ROI on your online networking efforts. They give an abundance of tips and strategies to develop relationships using LinkedIn. Learn how to automate and leverage relationships through Social Fusion. I strongly recommend this book to anyone that wants to increase their sales results. If you want to build visibility and develop profitable relationships, read this book!" "Linkedin can be your sales secret support weapon when you learn how to successfully navigate social networking on LinkedIn. Whether you are an old pro looking for new strategies or a new user just getting your feet wet, check out this "quick-start" step-by-step guide. Chris has helped minimize my feelings of being overwhelmed by Linkedin, and has empowered me through the "participation puzzle." "LinkedIn has quickly emerged as a powerful networking tool, andthis book is a terrific actionable guide to help the savvyprofessional leverage LinkedIn effectively. The Rules provide astrategic framework that enables the user to quickly build theirLinkedIn network, and more importantly, use that network todrive their LinkedIn `brand' to deliver results, opportunities,and action." I still meet a lot of people in job search who are not familiar with LinkedIn or if they are, they have no idea how to leverage its power for an effective job search campaign. I just finished reading 42 Rules for 24-Hour Success on LinkedIn. This is a great book for the LinkedIn novice because authors Chris Muccio, David Burns, and Peggy Murrah offer the reader guidance on the strategy of LinkedIn and a step by step tutorial on how to use all of its features. You can save yourself a lot of time and energy by reading the book and then applying the information to your LinkedIn strategy. You really can get up to speed on LinkedIn in 24 hours if you read this book. From front to back cover, you should be done with the book in an hour. This leaves you 23 hours to create your strategy and get comfortable with navigating the site. If you have been thinking about adding online networking to your search strategy in 2009, this book is a great place to start.